Hot price bundle offer for Artec 3D scanners, Artec Studio and Geomagic Design X extended through 2016! Reverse engineer mechanical parts and systems using Artec 3D scanning solutions bundled with 3D Systems’ Geomagic Design X software. Artec is bringing you the best in reverse engineering, and at the best price. In October 2015 we announced special offer bundles of Artec 3D scanners and Artec Studio 10 software + 3D Systems’ Geomagic Design X at highly discounted prices. Due to the popularity of these bundles, we have decided to extend the offer until the end of 2016. With Artec 3D scanners Eva and Space Spider you are guaranteed to obtain the most accurate 3D model of a mechanical part or system. The scanners capture the most complex geometry of an object in 3D, and the data is processed in Artec Studio 10, which ensures fast and precise scan alignment and fusion, texture rendering and mesh optimization through the powerful automatized processing. The model can then be exported to Geomagic Design X, which has an array of tools to reverse engineer the object. Check out how easily you can modify a 3D model of a compressor in Geomagic Design X. This watertight 3D model was made using Artec Spider and is so accurate you can easily work with the object’s smallest parts, changing their size, editing them out, smoothing their shape and much more. Check out how easily you can modify a 3D model of a compressor in Geomagic Design X. 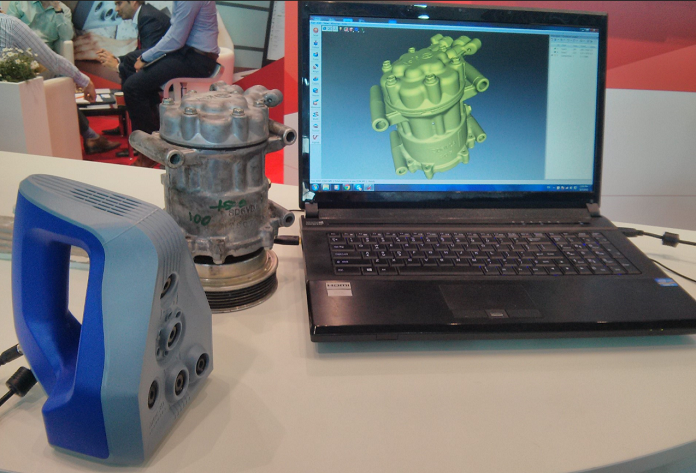 The compressor was scanned using Artec Space Spider at the Control 2015 tradeshow. Drop us an email at sales@artec-group.com and we’ll get back to you shortly. More info about Design X and the free trial can be found here.